New Year is the day of inviting new righteous things to Life by removing negativity of past. On this year 2016, VedicFolks going to invite "Phenomenal Power of Universe-AshtaMatrikas" to your life to remove all negativities, black magic, Stress, diseases, misfortunes, court cases and other intolerances in life. Join with us and seek blessings from Powerful Universal Source - Ashtamatrikas. 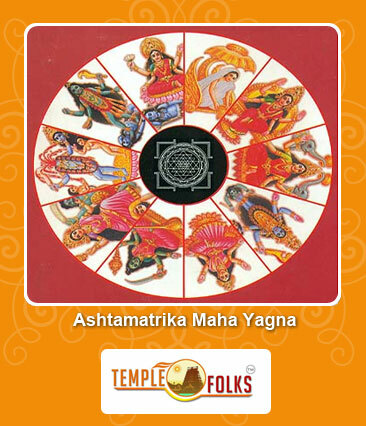 Ashta Matrika's (Brahmani, Maheshvari, Kaumari, Vaishnavi, Varahi, Indrani, Chamundi, Narasimhi) eight forms of goddess, from this seven matrika's are considered to be the female forms of seven gods and their power (Brahma, Shiva, Shiva, Indra, Karthikeya, Varaha, Narasimha) + Chamundi is the power of Maa Chandi usually identified with devi kali , all together appeared in the world as Ashta Matrika's to demolish the Evil-Devil (Demon) "Anthakasur". Those who perform this Ashta Matrika's Maha haven/fireritual will get complete divine protection against Evil effects/ Demon's. The Maha yajna of this Vedicfolks Premium Shared ritual includes all eight form of Goddess Japa and Homam (Fire Rituals). Ganesha puja, Sankalpa to sponsors, Avahanams, Ashta Matrika Japa (Moola mantra Japa for all the 8 forms of Matrika?s), Agni Invocation, Ganesha Homam, Ashta Matrika Homams (All the 8 forms of Goddess Shakthi), Sri Suktham, Purna Huthi and Namaskaram process. 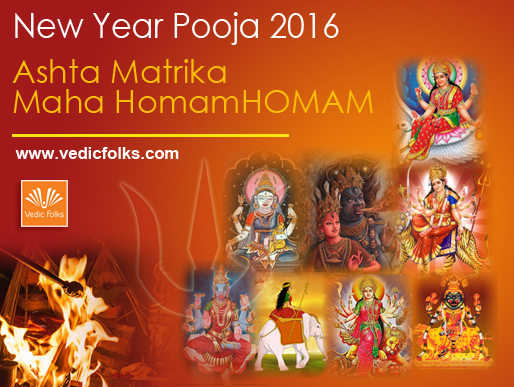 The most important benefit of performing Ashta Matrika Maha homam on the day of New Year is that the devotees will get divine blessings and boons to live a struggle free life. Vaishnavi Homam: Performing Vaishnavi Homam is helps to recuperate from frequent misfortunes in life and to get relief from any sorts of hazards. 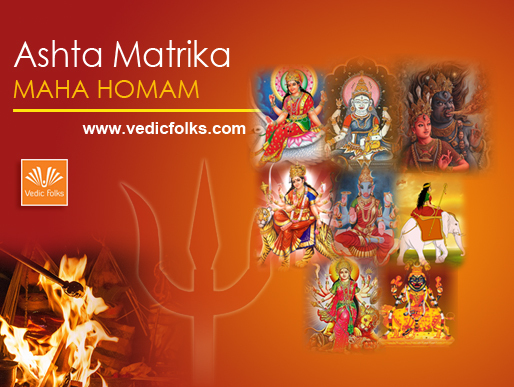 Chandi Homam: Chandi (Chamunda) Homam is considered to be very powerful homam which helps to eliminate hindrances and difficulties in the path of success. 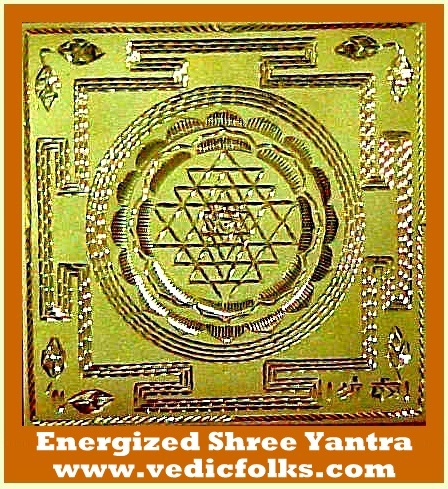 We at Vedic Folks are proud to possess the most authoritative experts who have the knowledge and ease to invoke these powerful radiations of all the eight (Ashta) forms of Goddess Shakthi ( Matrikas) who can bring all kind of fortunes in life !